I bet you all remember your first time….. I remember mine like it was yesterday. I had 6 sheets of printouts, words that meant gluten, food additive lists and so on in my bag. The cheat sheets, I didn’t go shopping without them for the first 3 months! I had the youngest in a well wiped trolley (who needs gluten on the handle right? ), the oldest walking, and I had brought a helper just to keep the kids entertained so I could concentrate fully on reading labels. Up and down the aisles we went. Products got held, read, and for the most part… put back on the shelf again. In my head was the ‘when in doubt leave it out’, and there was just so much doubt! I mean, exactly what IS thickener? Or Modified starch, or Colouring, or E bla bla bla? At home its so easy, you just google. In the shop, that first time, It was like being dropped in a haystack to find the needle. The needle being the gluten free food. Once you learn to shop smart shopping is faster. Know that Kraft, Oscar Mayer, Heinz and many others will actually declare gluten in a way you can understand- they have as a company policy to not hide it in a fancy word. Learn that starch generally means corn in an American product, could be potato or wheat in a European product (but should be declared if its wheat) and in Australia it could be any of those. Australian products are usually good at declaring gluten. This is all very general, and not a rule as such, but it will help you to know things like this when shopping – even if its general. Get familiar with food labelling laws in different countries. Living in the UAE we really need to know them all, or at the very least, the basics. Look for whole foods, basically, anything that hasn’t been ‘messed with’. Rice, potatoes, veggies, fruit. Once a fruit or vegetable has been cut, dried or frozen, watch out, things may have been added to it in the process. Frozen French fries for instance may have gluten in them, because they use flour to prevent the fries from sticking together in the freezer. Cereals are also tricky, because even though cornflakes for instance are made of corn, they may have added malt flavouring in them which contains gluten. The cereal may also have been made in a factory producing tons of wheat / gluten products, in which case your cornflakes may not be very gluten free at all. I now only buy cereal brands that I know are gluten free and that say so on the label. Processed meats can also be tricky, even if the meat you choose has the ‘gluten free’ label, is the deli counter man or lady cleaning the equipment before slicing? If something does not have the gluten free label in the deli counter, don’t rely on the person working there to be able to tell you. They may not even know exactly what gluten is. I rarely ask for help now as I find I end up educating the staff instead. On more then one occasion when I have asked for something gluten free have I been given something that quiet obviously has gluten, something with breadcrumbs, rusk, etc. You are not safe with drinks either. A kids drink for example may have added colouring, which in turn may contain gluten. Stick to organic when you can and 100% juice. If an orange juice says 73% orange then you really should wonder what the remaining 27% is! Chocolate milk powder also often contains gluten, there are gluten free alternatives but they can be very expensive. American Garden do a chocolate sauce which is gluten free, we use this for the kids chocolate milk. Many of the other American Garden products are also gluten free. You can go on their website and check for a list easily. Mayo may have starch that could contain gluten, so again, pick your brand and stick with it (we use Heinz). Even now that I have experience in choosing safe foods, a shop can take a long time, but if I have to and I stick to foods we get all the time, I can do a quick shop too. My best tip, get a smart phone! At first I would write down things I was unsure of and go home and google (then go back to the shop and buy the product if it was safe), now, I just google there and then in the shop. A network of Celiac friends is also a great help, I often call and ask someone if Im not sure, make sure the person you ask knows their stuff though. I read that handwashes dishwashing liquids , house hold cleaning products can have gluten too. Any idead about that? 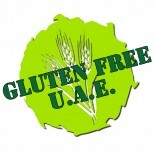 This entry was posted on 03/02/2012 by glutenfreeuae in Living Gluten Free and tagged dubai, gluten free, glutenfree, shopping, UAE.